Each morning I sit on a crowded, noisy, hot, hulking train speeding into Sydney's CBD to work in the city and I miss the light, the ancientness, the delicacy, the visual pleasure of Venice. 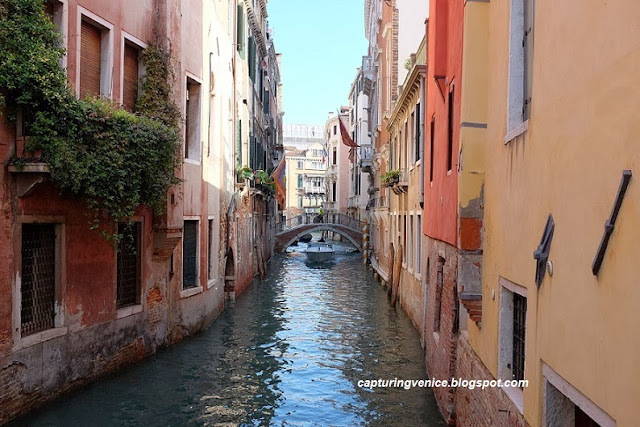 I live in a country that is at least a 21-hour plane ride from Europe, and I can’t think how I will ever be able to look enough, to see enough – up, down, straight ahead and then all over again - to know Venice as well as I would wish to do so. On these train journeys, I’ve been re-reading Paolo Barbaro’s wonderful, dense, poetic, love letter to his city, Venice Rediscovered, which was written on his return to Venice, after he had spent years living and working in other Italian cities and overseas. And it’s comforting to know that even a Venetian resident can feel this sense of desperate urgency to see Venice and to walk its every inch. I first read Venice Revealed as a library book, and there was so much to absorb and re-read and comprehend in Barbaro’s book that I later purchased it as an e-book, and lately I’ve ordered a hard copy version in both English and Italian. My holiday project over the Christmas/ New Year break was to tackle Barbaro’s marvellous prose in its original Italian version (I'm still going with this!). Venice Revealed and Venezia La Citta Ritrovata are widely available through online book stores and through iBooks/ Google Play. I highly recommend this book to anyone who loves to read and who loves Venice. NOTE: I wrote this recommendation because I love the book. I haven't received payment of any kind for this post. I wanted to tell you that I totally know what you feel, although I am not as far of Venice as you (7 hour plane ride). I also read Barbaro's book and remember that passage about picturing every detail. An impossible task it seems. All we can do is enjoying as much as we can. Thanks for the nice post. Have a good week! Oh, boy, how his words speak to us! AnnaLivia, you're so right, we have to breath in, absorb what we can while we're here, to sustain us for the next time. We're so lucky to have had this opportunity. There's such a gap between what we experience in the very young countries we live in, and that of the ancient cities of Europe. Yvonne - hello again! I just left my office to buy a sandwich for lunch. I walked down Macquarie Street admiring the architecture and reflecting that when James Cook first arrived on our eastern shore in 1770, the Republic of Venice had already existed for over a millennium - and had less than thirty years to survive. Our human history is mind boggling.